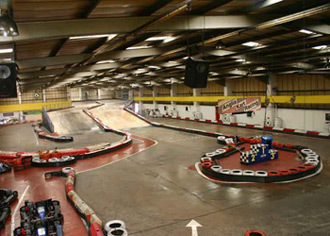 Anglia Indoor Karting is one of the longest-running tracks in the UK and is ideally placed for those in the Ipswich area. The venue runs three types of kart: Adult Karts (16yrs+): 7.5hp 215cc LPG engines – capable of reaching up to 40mph, Cadet Karts (8yrs+): 6hp 160cc petrol engines – with speed restriction for beginners and an adjustable seat position to accommodate children from 127cm and Kubz Karts (5-7yrs): Battery operated for use on their kubz mini circuit. Leave the A14 at juntion 54 then head east on Sproughton Road. Turn left into Farthing Road and Anglia Indoor Karting is at the end of this road. Entertain up to 10 children between the ages of 8 and 15 years for an hour. The track will provide everything, from racing suits and helmets, a video briefing, to computer monitored lap times, exclusive use of the track and party room plus soft drinks and party bags. Prices vary depending on the time and day that you choose to make your booking. The venue provides cooked meals and has vending machines. Minimotos (mini-motorbikes) are allowed on the circuit.